Cresteds have done well in obedience competition, and here is proof of the pudding! "Smoky" is sired by "Leo" . After completing his championship, Smoky went to live with Elaine Dunbar of Silverbell Arabians. 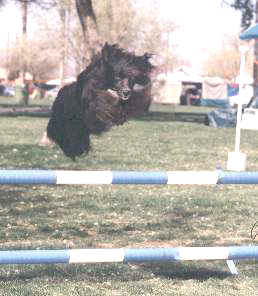 Elaine trained him for obedience and agility and he has earned many awards and titles in both events.